Who said it: P.J. Fleck or Tim Brewster? When Tim Brewster was introduced as U football coach 10 years ago, his first press conference was filled with colorful quotes. How many of these 10 quotes can you correctly identify as coming from Brewster or P.J. Fleck? 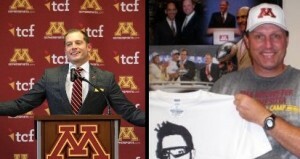 The comparisons between current Gophers football coach P.J. Fleck and former Gophers coach Tim Brewster start and stop with their outgoing styles. Fleck was brought in after coaching an undefeated regular season at a D-I school. Brewster had never been a head coach or coordinator in his life. Big football difference. There’s nothing wrong with genuine enthusiasm, and there’s no reason Fleck can’t succeed with the Gophers even though Brewster did not. OK, with that throat-clearing out of the way, a lot of people have suggested it would be fun to compare Fleck’s opening news conference Friday with Brewster’s opening news conference almost exactly a decade ago in January 2007. Both were boisterous events filled with colorful phrases and visions of success. And let’s face it: every news conference starts to sound the same after a while. So: let’s have some fun. I want back and found the transcript from Brewster’s introductory presser. I of course also have Fleck’s transcript. I was physically there for both events, too. Below, you will find 10 combined quotes — five from Fleck, five from Brewster — from those first news conferences. Can you guess who said what? Answers are at the bottom. 1) We share a vision of winning the Big Ten and having Rose Bowls. And I’m not afraid to say that because that’s the way I live my life. I’m not afraid to hide behind something and say, you know, I can’t promise you something. I’m going to promise you a lot, because that’s the way I live my life. And that’s what I want to be able to create here at the University of Minnesota. 2) Our expectation is to win a Big Ten Championship now. We’re not interested in any rebuilding process. I’m very fortunate that I’m not coming into a situation that is decimated where there are no players. There are players here. … They’ve won a lot of games. They’re not void of talent, so we’re in a little different situation here than it is at most places that are going through the hiring process. 3) I tell you this, I’m very confident in doing the job I do, and you’re going see that confidence flow through our players. 4) These players have a thirst right now and I’m going to give them what they’re looking for. I promised them one thing, and that is I will never let them down. 5) We’re going to start here first. We’re going to recruit every kid in the state of Minnesota who we feel can help us (win) a Big Ten Championship and take us to the Rose Bowl. I’m going to personally recruit the state of Minnesota. 6) We’re also going to recruit the finest student-athletes in the country, and you know where we’re going to start, and you know where we’re going to build walls up around? Our elite state of Minnesota, and that’s what I’m dedicated to. 7) I went to the National Football League to get my PhD in football. I was a great recruiter and a good football coach, but I wanted to study the game at a level in which you can’t do at the college game. 8) My entire life has been about running into the fire, not away from the fire. I eat difficult conversations for breakfast, and that is why I took this job. For every reason not to take a job, that’s why I took it. That’s the story of my life. 9) Why the University of Minnesota? Why not? This is a dream of mine ever since I was a little kid. To be able to play in the Big Ten, wasn’t fortunate enough to do that, got to play against Big Ten, but to coach in the Big Ten and to surround myself with people that would allow me to have that opportunity. 10) I feel like I am a Big Ten man. … I knew of the Golden Gophers’ reputation but didn’t realize the University of Minnesota has won six national championships, 18 Big Ten championships, and gone to numerous bowl games. As I continued to study the academics of the school, the tradition, the football history, and the University itself, I got excited. The best young player on the Vikings is ... Danielle Hunter?